Sweden has a long tradition with aquavit and PRIMAs range of Swedish brands has roots dating back to the 17th century. We had the great pleasure of providing digital homes to every classic brand and developing the category as a whole. Every classic brand in this extensive portfolio has now received their own digital web presence with product information, and their unique brand story and heritage described. The 14 brands that make their digital debut are Bäska Droppar, Gammal Norrlans Akvavit, Hallands Fläder, Herrgårds Akvavit, Läckö Slott, Nyköpings Brännvin, O.P Anderson, Rånäs Brännvin, Skåne Akvavit, Svartvinbärs Brännvin, Årsta Brännvin, Örtagårds Brännvin, Östgöta Sädes Brännvin. 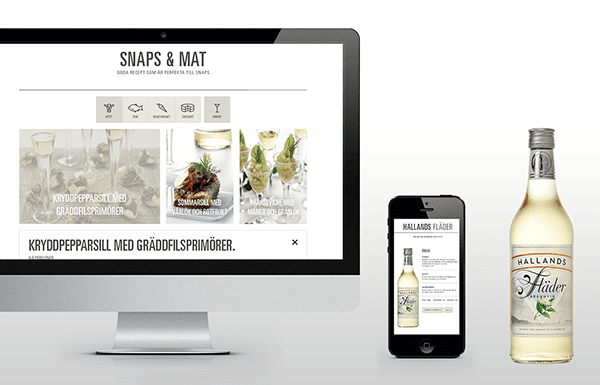 In developing the category for snaps and aquavit as a whole the shared digital space svenskasnapsar.se has also been created. Here is information and inspiration on classic and modern usage of these products. Morgenland also produced a series of films where PRIMAs own spice master Jonas Odland and well known Swedish masterchef Fredrik Eriksson meet up and discuss snaps, food and the best ways of enhancing the taste sensation.